Track the Startup: this handbook helps founders keep track of the new business and avoid surprises, thus mitigating risk. 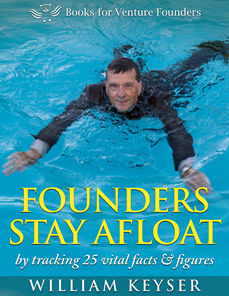 Founders Keep Afloat: by tracking 25 vital facts and figures will show you exactly what to track and how. Many first time entrepreneurs, myself included, are both passionate about their business and run off their feet—and forget to track the startup. They often find setting priorities to be an almost impossible task. They are generally much more interested in doing, than monitoring. Of course it’s vital to keep our passion, but at the same time you must keep track of the new business and progress—to keep ahead of the game—even checking that you remain true to your purpose. Most of the data to track are financial, though a few while still numerical, are not directly about money. The book Founders Stay Afloat will help you with both, without getting bogged down in detail, or worse, leaving the data tracking to someone else, like the bank! Entrepreneurs who fail to track the startup and its performance are very likely to find revenues don’t match plans, cash gets short, the business reputation goes awry—and worse. One of the big reasons for business failure is that founders do not track the startup and find themselves unable to keep the business going. Of course, you check the monthly accounts, but they are only past history. That is simply not the only item on you list to track. What is coming down the pike may be difficult to gauge, but is vital if you’re not going to be surprised. 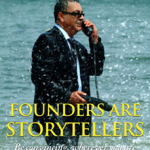 One of the other most obvious mistakes is that founders do not track things outside their office. To track the startup fully you need to take account of what customers are doing and thinking, and how the products are performing. Some of the data may be ‘soft’, as in attitudes, rather than ‘hard’ as in accounts. If you don’t track the startup and continue failing to notice what is really happening, chances are high that you will blunder along making the same mistakes over and over again. Lack of awareness is no excuse. Paying attention to what’s happening and being able to make changes in the business can only come from your ability to track the startup and its progress. Failure to track your startup will end in the failure of your startup. Here are some other places that you can get help on how to track the startup, at Venture Founders: Market Intelligence, Reducing Risk to Startup Safely, Variance Analysis, Key Performance Indicators, Goal Tracking Tool, Critical Success Factors, and many other pages.